What are brand marketers’ top priorities for 2018? Branding has always been a hot topic of discussion amongst marketers, as there seem to be a number of different definitions and purposes of brand marketing that marketers can adhere to. Years ago, branding could simply be pinned down to defining a set logo, slogan, colour palette etc. However, in today’s day and age, branding has become a tad bit more complicated. Branding can be that ‘feel-good’ emotion that your customer experience when they hear your brand name, it can be the feeling that makes them associate to your brand identity and the perception that customers get, when they see your brand. Every year, the focus of branding and brand marketers keeps shifting, given the top marketing trends of the year and the latest developments in technology. 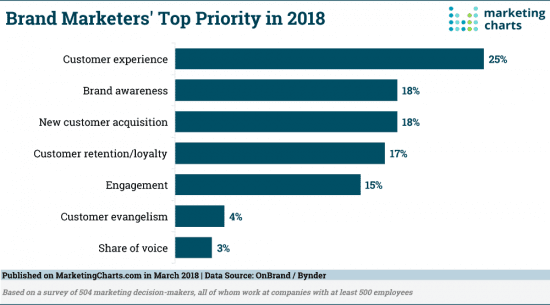 A recent chart from MarketingCharts, based on the ‘2018 State of Branding report’, shows the top priorities for brand marketers for this year. The leading priority for 2018, as cited by one-quarter of respondents, turned out to be customer experience (CX). This comes as no shock, as customer experience has been a highly sought after 2018 goals for marketers. Closely after CX as a top priorty, comes brand awareness (18%), new customer acquisition (18%), customer retention/loyalty (17%) and engagement (15%). In separate research, MarketingCharts highlighted CX to be marketers’ single most exciting opportunity. With artificial intelligence and personalization being the buzzwords in marketing, brand marketers are constantly looking for more innovate ways to improve their customer experience.